Use the Shading Editor dialog box to create and manage shading components. For shape, vector drawing, and title objects, you can create flat or gradient color fills or scaled, stretched, or tiled image fills. Text and code objects can only have solid color fills (except in SVG output). You can tint or adjust the contrast and brightness levels and map the transparency of image objects. Use the Shading Editor dialog box to create interesting and reusable shading components to apply to objects. Press the ALT+S keyboard shortcut. 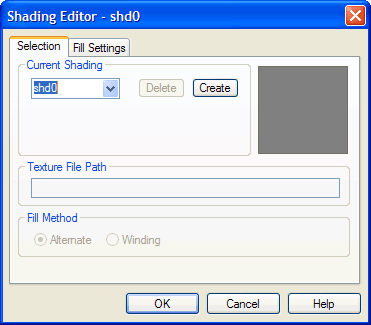 In the Shading Editor dialog box, the shading most recently edited will appear selected, but you may select any shading in the project from the Shading Selection drop-down menu.